We’ve had a house, and so also a garden, for eight growing seasons now, and I waited this long to plant a poppy? 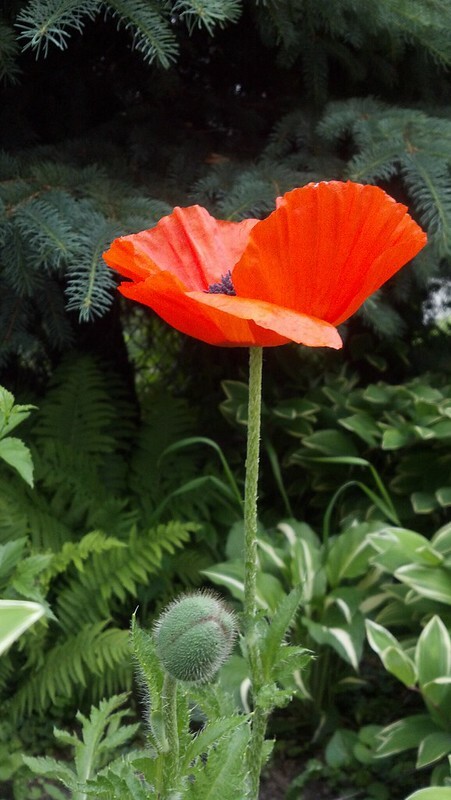 Perhaps it was due to confusion from a seed packet I’ve had that long for Icelandic poppies: those required sowing in the fall, to allow for spring blooms. I tried that in year one with a Helleborus, and never got a flower, nor even a plant, from that effort. Perhaps that was just due to poor location and truly novice gardening skills. However, last fall I bought this poppy plant on sale, and so far, so good – even in the half-day shade from that pine tree. Same goes for the beat-up hydrangea that I bought: it’s looking a lot better now. Mild winters can evidently right some wrongs, including neglect at a plant nursery. I’m very glad we did adopt this poppy; this tomato-colored beast allowed my eyes and phone camera to fondle it for a few moments, before I headed to work this morning. What you don’t see so well in the shot at left is the rich purple color in the middle. Divine! When I first approached it, one of its discarded sepals was sitting right inside the bloom. How the flower achieved this feat of dexterity, I’m not sure. Normally, once the bud opens, the leaf-like sepals that protected it normally fall off, tumbling to the ground beneath. Perhaps a wind gust or a playful and strong bumble bee (I’ve seen a few big ones, lately) gave an assist. My assist came in the form of moving the sepal to its rightful place. The petals of this flower so closely resemble used cupcake paper that it made me a little hungry and also a little eager to do some baking. We’ve almost exhausted the supply of Quinoa Blueberry Muffins in the freezer, so I may need to get that oven going, this weekend. That muffin recipe – but please note that for me, they turned out a lot more plump, purple-swirled, and tasty-looking – is here. The new breakfast foods hunt continues: last night I filled the maw of our crockpot with breakfast fixings, and when I got back from my morning run today, hot food awaited. Recipe is below. adapted from a similar recipe in the excellent cookbook, The Vegan Slow Cooker. Spray or oil the interior of your crockpot. Place all of the above into the crock, mix, and cook on low for 8 hours. If needed, serve with a little more milk, Top with walnuts. Makes 3 servings. Why it doesn’t make 4, I’m not sure, as that amount of Izzy’s usually makes 4 servings. It’s crock pot magic! Or perhaps I was just really hungry after a fast 5-mile run and a little weeding, near the poppy.